Microsoft has finally added support for the MacBook Pro’s Touch Bar to its Office apps on macOS, although currently it’s only accessible to those who are testing the productivity suite (full availability shouldn’t be long at all in coming, though). Yes, Insiders who are testing Office for Mac on the slow ring (where more stable builds are deployed) can now try out the various different functions the context-sensitive bar will bring to Word, Excel, PowerPoint and the rest. The preview version of Office you’re looking for is v15.31 (170207), and Microsoft declares that it puts “the most relevant commands to what you're working on are at your fingertips”. That includes a ‘focus mode’ for Word which gives access to various formatting options, allowing for the ribbon to be ditched and freeing up some more space on the screen. Excel will highlight recently used functions and other useful bits and pieces, whereas PowerPoint will show a thumbnail overview of slides in your deck, allowing for the reorganization of them directly on the Touch Bar. It’s been something of a long wait for this, seeing as Microsoft promised Office for Mac support right back when the Touch Bar-toting notebook was first showed off by Apple last autumn. 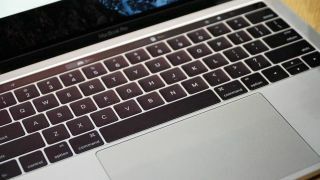 Since then, a number of major apps have beaten Office to the Touch Bar, including Adobe Photoshop, along with Apple’s own Final Cut Pro and Logic Pro X, and Spotify among others.